Beautifully engraved certificate from the Oregon and Trancontinental Company issued in 1882. 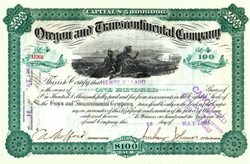 This historic document was printed by the American Banknote Company and has an ornate border around it with a vignette of indians looking at a train. This item is hand signed by the Company’s Vice President and Assistant Secretary and is over 136 years old. The Oregon and Transcontinential Company was a holding company organized by Henry Villard. They controllled the Northern Pacific and Oregon Railway and Navigation Company which was a dominant force among railroads in the Northwest. Henry Villard Photo from Henry Clew's Book " My Fifty Years on Wall Street"
Henry Villard (1835 - 1900)was a journalist, railway promoter, financier,whose name was originally Ferdinand Heinrich Gustav Hilgard, was born in Speyer, Rhenish Bavaria, the son of Gustav Leonhard Hilgard and Katharina Antonia Elisabeth (Pfeiffer) Hilgard. He came from an important family, his father being a jurist who rose to the supreme court of Bavaria, while two of his uncles were leaders in the revolution of 1848 in Rhenish Bavaria. Young Heinrich's sympathy with their republican sentiments estranged him from his father and the boy was sent for a time to a military school at Phalsbourg in Lorraine. He graduated from the Gymnasium in Speyer, and attended the universtities of Munich and Wuerzburg for a time, but disagreed again with his father and emigrated to America. Fearing that his father would have him returned to Germany and placed in the army, he adopted the name Villard, which had been borne by one of his schoolmates at Phalsbourg. Upon landing at New York in October 1853, he proceeded to the West by easy stages, spent some time in Cincinnati and Chicago, and eventually arrived at the home of relatives in Belleville, Ill. During the year 1855-56 he successively read law, peddled books, sold real estate, and edited a small-town newspaper, but made little progress along any line except the mastery of the English language. Increasing facility in the use of his adopted tongue served to equip him for the field of journalism which was to occupy his attention largely for the next decade. In 1858 he served as a special correspondent for the Staats-Zeitung of New York, observed and reported the Lincoln-Douglas debates for that paper, began a personal friendship with Lincoln, and collected his Lincoln stories, which have since been widely quoted. Service with this German-American paper, however, he regarded merely as preliminary to his real objective - a regular berth with the English-language press. Late in 1858 reports of the discovery of gold in Pike's Peak country so aroused his adventurous spirit that he conceived a plan for a journey to the Rocky Mountains in the role of a correspondent, made a connection with the Cincinnati Commercial, and in the spring of 1859 set out across the Plains. His sojourn of some months in the mining camps not only enabled him to make the aquaintance of several noteworthy men, including Horace Greeley, but provided him with the materials for a guidebook for immigrants which he published in 1860 under the title The Past and Present of the Pike's Peak Gold Regions, a very accurate account of the natural resources of Colorado and a rather extraordinary achievement for a young man of twenty-five who seven years before had not kown a word of English. As correspondent for the Commercial he covered the Republican National Convention at Chicago in 1860, and he served in a similar capacity for that paper, as well as for the Daily Missouri Democrat of St. Louis and the New York Tribune during the ensuing campaign. With the election of Lincoln, he was selected by the New York Herald as its corresponent at Springfield, Ill. Here he remained until the departure of Lincoln for Washington, supplying his paper with regular dispatches, which the Herald was forced to share with other members of the New York Associated Press. Since at the same time Villard corresponded freely with Western papers, a considerable portion of the political news which the country read during those memorable weeks was supplied by the young immigrant who had not yet turned his twenty-sixth birthday. With the outbreak of the Civil War, he suppported the Union cause and became a war correspondent, first for the New York Herald, and later for the New York Tribune, accompanying the Union armies in Virginia and the West until late in November 1863, when ill health forced him to abandon field work for a time. The following year, in conjunction with the Washingtong representative of the Chicago Daily Tribune, he organized a news agency to compete with the New York Associated Press, and represented his agency with the Army of the Potomac in the campaign of 1864 in Virginia. Upon the conclusion of the war, he served as a corresponent in the United States and Europe until the autumn of 1868, when he became secretary of the American Social Science Association, with headquarters in Boston. This work, in addition to bringing him into the movement for civil service reform, enabled him to study and investigate public and corporate financing, including that of railways and banks, and thus indirectly prepared him for the most notable phase of his career - that of railway promoter and financier. In 1871, to restore his failing health, he went to Germany and then to Switzerland. In Germany again, in the winter of 1873, he was brought into contact with a protective committee for the bondholders of the Oregon & California Railroad Company. He became a member of the committee, and the following year was sent to Oregon as their representative, to investigate and recommend as to the future policy to be employed by the bondholders. He perfected a plan for the harmonic operation of the Oregon & California Railroad, the Oregon Central Railroad, and the Oregon Steamship Company, which owned a fleet of steamers plying between Portland and San Francisco; in 1876 he became president of the first and last named companies. Meanwhile he had joined a committee for the protection of the bondholders of the Kansas Pacific Railway, and when in 1876 this company became financially embarrassed he was named a receiver of the road, a position which forced him to match his wits with such redoubtable foes as Jay Gould and Sidey Dillon of the Union Pacific. It was in connection with this company that he achieved his first important financial success and laid the foundation of his later fortune. Villard's real love, however, was the Oregon country. On his first visit to the region he had been very favourably impressed with its possibilities and there gradually developed in his mind the idea of building a railway empire in the far Northwest. Perceiving the great strategic value of the south bank of the Columbia River as a railway route, he purchased the Oregon Steam Navigation Company from Simeon Gannett Reed and his associates in 1879, organized the Oregon Railway & Navigation Company, and proceeded to construct a railway eastward from Portland along this route. His plan was to make this line the Pacific Coast outlet for any northern transcontinental railway which might be built, and to concentrated the trade of the Northwest in Portland. As he progressed with his plans, however, he clashed with the Northen Pacific, then recovering from the financial disasters of the seventies, whose objective was Puget Sound. Appreciating the great advantage which the superior harbor of the Sound would give the Northern Pacific over his own road with terminus at Portland, Villard resolved to prevent the completion of the rival road. When his offer of running rights over his line to tidewater was refused, he decided to purchase a controlling interest in the Northern Pacific. After quietly buying the stock of the Company to the limit of his recources (December 1880 - January 1881), he appealed to his friends and supporters for assistance. Issuing a confidential circular to about fifty persons, he asked them to subscribe toward a fund of eight million dollars, the precise purpose of which was not then revealed. It is eloquent testimony to the confidence which he inspired in men that, besides the sum first requested, an additional twelve million dollars was eventually subscribed. This transaction, commonly known as the "Blind Pool", remains one of the notable achievements in the annals of railway finance. With the means thus secured he established his control of the Northern Pacific; he organized a holding company - the Oregon & Transcontinental - to harmonize the interests of his various railway properties; on Sep.15, 1881, he became president of the Northern Pacific, and completed the line in 1883. Since he also controlled the Oregon & California Railroad, and had recently organized the Oregon Improvement Company for the development of the natural recources of the region, he now dominated every important agency of transportation in that part of the country. His triumph, however, was of short duration. Because of a combination of circumstances, including faulty estimates of construction costs, the Northern Pacific, upon its completion, was confronted with a huge deficit which forced the resignation of Villard from the presidency early in 1884. From 1884 to 1886 he was in Germany, recovering from a nervous breakdown; in the latter year he returned to New York as agent of the Deutsche Bank. With the aid of Germany capital he saved the Oregon & Transcontinental in September 1887, and reentered the board of the Northern Pacific in 1888, where, for the next two years, he strove earnestly, but unsuccessfully, to effect an adjustment of the clashing interests of the various cities and transportation companies of the Pacific Northwest. His failure in this effort was attended by his retirement from the Orgeon Railway & Navigation Company, though after a brief interval he continued as chairman of the board of the Northern Pacific until 1893, when his railway career came to an end. Meanwhile Villard was displaying his versality by activities along other lines. His early realization of the possibilities of the electrical industry prompted him to extend financial assistance to Thomas A. Edison and to found the Edison General Electric Company in 1889. In 1881 he inaugurated, under the direction of Raphael Pumpelly, the Northern Transcontinental Survey, an examination of the Northern Pacific land grant of genuine scientific value. Nor had his activity as a financier dulled his earlier interest in journalism. When, through his finacial successes with the Kansas Pacific and the Oregon Railway & Navigation Company, he became a man of wealth, his thoughts quickly turned to the possibility of controlling a journal of independence and fearlessness, and of such high editorial standarts as to compel attention from the entire country. Accordingly, in 1881, he aquired a controlling interest in the New York Evening Post, placed Horace White, E. L. Godkin, and Carl Schurz in charge of the editorial department, and, as a guarantee of independence on the part of the paper, promtly abdicated the right of influencing its editorial policy. 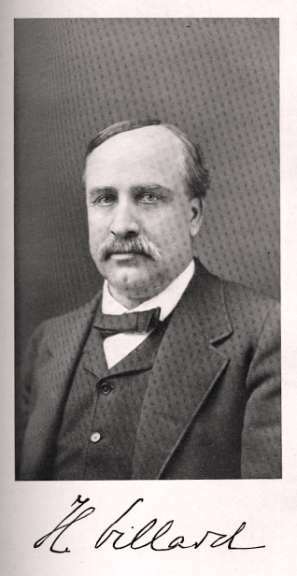 During the years 1879 to 1883 Villard was probably the most important railway promoter in the United States. In those years he was frankly aiming at a monopoly of transportation facilities in the Pacific Northwest; yet he showed no disposition to take unfair advantage of such a position, or to victimize the people of the region. Although alert to the protection of his interests against rival companies, he displayed fairness, moderation, and breadth of view in dealing with the cities on the Coast. On Jan. 3, 1866 Villard married the only daughter of William Lloyd Garrison. In 1879 he established a home at Dobbs Ferry, N.Y., where in his sixtysixth year he died. He was survived by his wife, Helen Francis Garrison Villard, with a daughter and two sons.